The community at the Imperial College Advanced Hackspace showcased their inventions at a recent demo day. Imperial College Advanced Hackspace provides cutting-edge prototyping equipment and professional support to help Imperial’s community turn their ideas into innovative products and technologies. There are hackspaces across the South Kensington Campus, and last year the College opened a bespoke workshop at The Invention Rooms in White City. This new facility, one of the largest of its kind in the world, contains a fully equipped bio-lab, alongside state-of-the-art 3D printing, electronics, metalwork and woodwork equipment. Last week, startups and projects developed at the Hackspace had the opportunity to display their innovations at an exhibition in Imperial’s main entrance, part of the College’s Enterprise Month. Synbiosys, founded by Imperial alumnus Dr José Videira, are developing pop-up shelters to protect people from harm in conflict zones or during humanitarian missions. The team are using cutting edge materials and new super-tough polymers to create the shelters, which can provide emergency protection from bullets, bomb-blasts, shockwaves and weather. Their unique design, inspired by origami, means that the structures are extremely lightweight and portable – designed to be carried by just one person – and can be deployed in seconds for emergency shelter. They can also be bolstered with sand or other materials to provide longer-lasting structures, which can easily be dismantled and re-used in future scenarios. The structures have been likened to “bullet-proof pop-up tents” and can be adapted to different scenarios including disaster relief, temporary housing, humanitarian aid, civil unrest and in conflict zones. 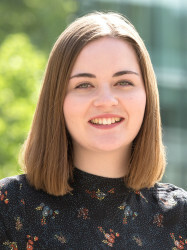 Synbiosys are funded by the Government’s Defence and Security Accelerator (DASA), who recently opened a new hub at Imperial College London’s White City Campus. Aiming to come up with a more sustainable way of growing food, Morphosis, founded by Innovation Design Engineering students, is a nature-inspired appliance that turns food waste into bio fertiliser. They use the process of anaerobic digestion, where microorganisms break down food waste in the absence of oxygen. This produces both a methane-rich gas that can be used as a fuel, and a bio fertiliser that can be used in farming to boost crop growth. According to the team, current processes do not recycle one hundred per cent of the waste, as many by-products are produced, so their process is more efficient. Morphosis would also reduce the amount of food waste ending up in a landfill site, where it breaks down in the same way but the biogas produced goes straight into the atmosphere and contributes to climate change. The appliance would recycle 100% of food waste within a certain boundary - for example, meat and dairy products would not be accepted by their system because they would produce pathogens in the process, which would not be efficient for bio fertiliser production. Going forward, they would like to offer a customised service to clients such as supermarkets, who could house these appliances at their sites, use them to dispose of their food waste, and use the fertiliser created for growing new crops. Seaquest is a collaborative project between Gary Fletcher, an Advanced Hackspace fellow and RS Components, a model components producer, to create a robotic surface vessel that can travel autonomously. They have created a 3D-printed model boat that can travel autonomously in open water and carry 50 kg of batteries for power. Their aim is to make it travel from Dover to Calais and make a world record attempt for the furthest 3D-printed autonomous model boat. With the project they also hope to inspire students interested in STEM subjects and challenge other universities to create their own 3D printed model boats. The team ultimately aim for the boat to be used for short-range missions, such as conducting surveys of the ocean floor. 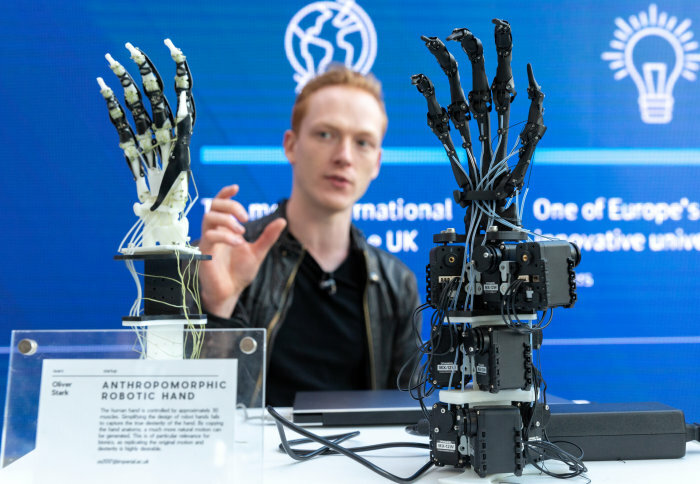 Oliver Stark, a postgraduate student from the Department of Bioengineering, has developed a robotic hand that mimics human anatomy to allow for more natural motions. He says that simplifying the design of robotic hands – such as those used in bionic limbs - means that they fail to capture the true dexterity of the human hand. By copying the structure of a human hand, he is creating a robotic hand that can perform the same movements and actions that a person could. Robotic hand that mimics human anatomy, developed by Oliver Stark, a postgraduate student from the Department of Bioengineering, filmed at the Advanced Hackspace Demo Day. Oliver hopes that his invention could mean that bionic hands might in the future have enough dexterity to allow a user to play a musical instrument like a guitar with ease. Established in 2014, the Imperial College Advanced Hackspace (ICAH) has helped to transform the prototyping community at the College. The Hackspace has over 3,500 active participants at present and every member of the College is eligible to join. In addition to this core group, ICAH also engages with commercial organisations and the local community in White City. The Hackspace’s mission is to give its members the tools and skills to take ownership of their projects and get making. In October 2017, ICAH expanded to the Invention Rooms in White City. It has a wet lab, a bio/molecular synthesis lab, a wood/metal workshop, a digital manufacturing studio, an electronics lab and an ideation room.